Solar energy has been with us for many years now, from the modest solar powered calculator through to the Blythe Solar Power Project in Riverside County, California (photo right) - this plant is capable of creating an amazing 485 MW of energy. These huge solar energy stations are extremely interesting and capable of creating vast amounts of electrical energy but the single most potentially life transforming enterprise in solar panel technology lies in easily accessible and affordable systems i.e. domestic photovoltaics. Photovoltaic (PV) cells convert light into electric current and are generally the technology behind domestic solar panel systems. Their affordability, durability and impressive effectiveness make them a viable energy generation solution for literally millions of structures across the whole of the UK. The advantages of having a Solar PV are tremendous and having a solar power system will influence not just your carbon impact but will, additionally, have surprising financial rewards. The initial expense of installing a Solar Energy Powered system is almost certainly going to be a substantial financial investment, it is however very much an investment as opposed to an eco-motivated luxury. A typical home Solar Panel system provides enough renewable energy to maintain your personal usage of electronic equipment, lighting and heating. In essence, by replacing the power you would obtain through the national grid, a Solar Panel system will reduce your electricity costs from the start. Bearing in mind the ever growing energy prices in the UK, this saving can only increase over time. Due to a fairly recent governmental initiative, solar panels earn the homeowner money on two fronts. Any power generated that you do not use is siphoned off to the national grid - who pay you by the unit for your electricity. In addition to this, the government's 'feed-in tariff' will earn you money for every unit (kWh) that your system produces (go to the Ofgem website for details of current tariff rates) - whether you use it or sell it back to the grid. The feed-in tariff system basically means that you are paid to power your home! Best of all, the feed-in tariff is guaranteed for 20 years - making it a guaranteed source of income regardless of what the future may hold. The mixture of savings, revenue and carbon footprint reduction make domestic solar panel systems one of the most valuable projects a home owner can engage in. Cautious estimates suggest a full return on financial commitment likely to occur within 8-10 years of installation, which means a guaranteed income and savings for at least 15 years after the point at which you break even. 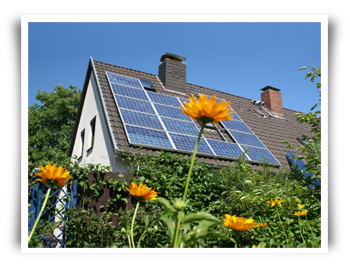 Running a solar power home will mean that you are helping to preserve our natural resources for the future. It also means that you won't need to concern yourself with the increase in cost of electricity and gas due to the fact that you are using the best source out there without damaging the environment. Solar energy is considered renewable energy because it is going to be a few million years before the sun burns out, solar panels are able to convert the sun's energy directly into electricity. The coal, natural oil and gas that we are using at present have taken thousands, even millions of years to form underground. We are over dependant on these resources making change a necessity. Sooner or later we will have to convert to renewable energy sources for a sustainable future, so it may as well be sooner. As the size of the population grows we are using more of our depleted natural reserves of fuel every single day. People today live longer due to advances in medicine and health care and we are a society dependent upon our electronic gadgets as well. Computers and electronic tools are now a huge part of our lives at home and at work. It is not practical to suggest we stop using the electricity that is needed for them to function. While our technological advances are, in the main, good things, the fact that we are using up our natural resources should be of concern to everyone. Fossil fuels are not a type of energy resource that we will be able to replace. When this resource is gone, it is gone forever - that is the reality of the situation. Can you imagine how would you keep your children entertained without video or TV games? Most of us have problems living without electricity for an hour or two, in a power cut - what would it be like if didn't come back? Solar panels are becoming more and more popular for residential use as our search for alternative energy sources expands. As the price of conventional fuels goes up, many people are starting to realize just how finite our supplies of oil and coal really are. Now is the time to act:Contact us and find out how we can help you to a greener future through a solar panel installation.